There is a code of silence about what is being discussed in current Israeli Palestinian negotiations. However, possible disastrous results of those talks were reached almost nine years ago. In March, 2005, Yuli Edelstein, then a deputy government minister and now the speaker of the Knesset, appeared at the Alon Shvut community center in Gush Etzion in which he reported to a stunned audience that the February 20, 2005 retreat decision of the Israeli government did not only apply to Katif and to four small Jewish communities in Samaria. Edelstein warned that the February 20, 2005 Israeli government decision was to redraw the areas of Jewish residency in the almost all areas that Israel acquired in the 1967 war. The new map, approved by the Israeli government, he said, was immediately posted on the web site of the Washington Institute for Near East Policy, and is posted there to this day for all American government officials to peruse. That Israeli government approved retreat map means that an additional 63 Jewish communities can be expelled and dismantled in their entirety by an Israeli government decision that has already been made. Prominent members of that Israeli government included Benyamin Netanyahu, now the prime minister of Israel, Tzippi Livni, then and now the Justice Minister of Israel, and Shimon Peres, now the president of Israel. However, this Israeli government approved retreat map remains unknown in Israel. 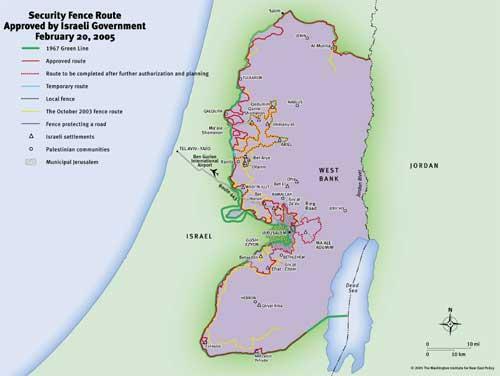 It has never been posted by the Israeli government nor has this retreat map ever or discussed in the Israeli public domain – not in the media, not in the Knesset and not in the current Israeli government, for fear of massive public opposition. That February 20th, 2005 retreat decision empowers the Israeli Security Establishment to implement surrender of almost all of Samaria, Judea, Hevron, and the entire Jordan Valley to an entity which remains in a state of war with the state and Israel. In other words, the conclusion of current Israel Palestinian talks has already been reached. Here is the Israel government approved retreat map which the government of Israel should share with the Israeli public, the Knesset, and the media. Retreat to the Auswitz borders? Israel/s government to to implement Hitler/s final solution..